Solal’s most recent refit included a full interior refresh with a brand new light décor. Her timeless yet contemporary interior features light fabrics that pair beautifully with high gloss cherry wood. The main saloon is a large and welcoming space with seating to port and starboard, a full modern entertainment system, and a formal dining set up forward. The pilot house provides an additional space for guests to make use of with leather seating and a table to relax at when underway, enjoying the sights and speed. The yacht is able to sleep eight guests in four luxurious cabins, all located on the lower deck, with three experienced crew on board. A large master cabin features a double bed, sofa seating, large wardrobes, and an ensuite with two entrances. The VIP cabin and two twins are similarly spacious and well-appointed all with ensuite. Outdoor living is a key focus for this beautiful design, with open spaces and large decks to enjoy. The main aft deck is the perfect spot for al fresco dining with a second main dining table and seating, while wide walkways lead to the forward main deck with padded seating that is perfect for relaxing and enjoying the sunshine. 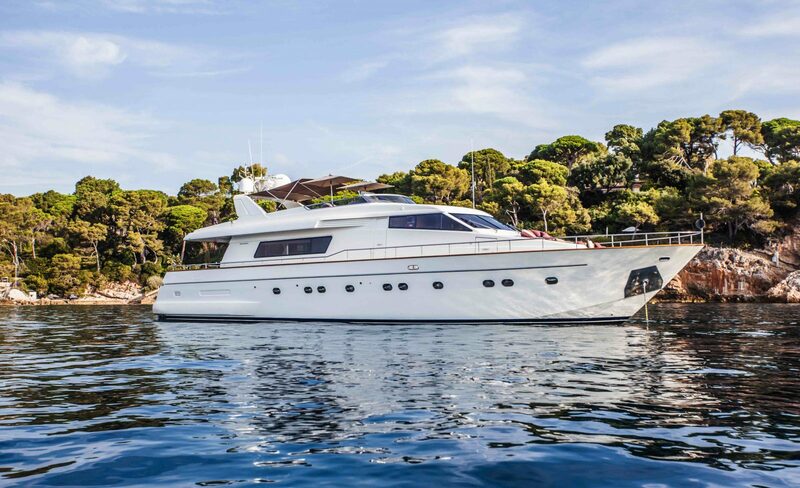 The flybridge deck is home to a second control station and yet more seating and dining arrangements including large U-shaped sofas and a dining/coffee table and a bar. Optional shadesails provide protection for the sun as desired. Built from GRP, Solal is powered by twin CAT 3412E engines and cruises at 22knots, reaching maximum speeds of 30knots, with a range of 400nm. She is fully MCA certified. Solal carries a number of toys including a 4.20m 50hp tender, towables, wakeboard, waterskis and snorkeling equipment. A large swimming platform, with swim ladder, is easily accessed from the main deck ensuring easy enjoyment of warm waters.